A 2,500-year-old bronze dagger believed to belong to the Dong Son culture has been discovered in a household in central Ha Tinh province. 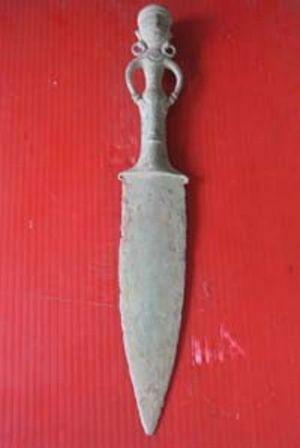 Le Ba Hanh, Deputy Director of the provincial museum, said on April 1 that a group of the museum’s specialists found the dagger when it was being kept by Nguyen Van Minh, a resident in Xuan Hai commune, Nghi Xuan district. The intact poniard weighs 1 kilogramme and measures 35 centimetres in length. It has a 15cm handle fitted by a 20cm-long, 5cm-wide bamboo leaf-shaped blade.